Prior to the first PermaBlitz the Chico Permaculture Guild held Pre-Blitz Gatherings in February and March to help inform people about the foundation of permaculture, the Ethics and Principles, as well as the permaculture design process as it was being applied to the PermaBlitz Host site. The main objective of these Gatherings is to gear people up to attend the PermaBlitz, help them understand the basics of permaculture and how aspects of the design were to be implemented for the PermaBlitz Host. The Earthshed PermaBlitz vision is to help our neighborhoods become more edible and resilient by harnessing and building the power of community. Joining together to design and build permaculture systems in our community creates lasting relationships to both the land and to each other. By increasing our local food security, energy efficiency and water conservation we are on our way to a vibrant and healthy future. 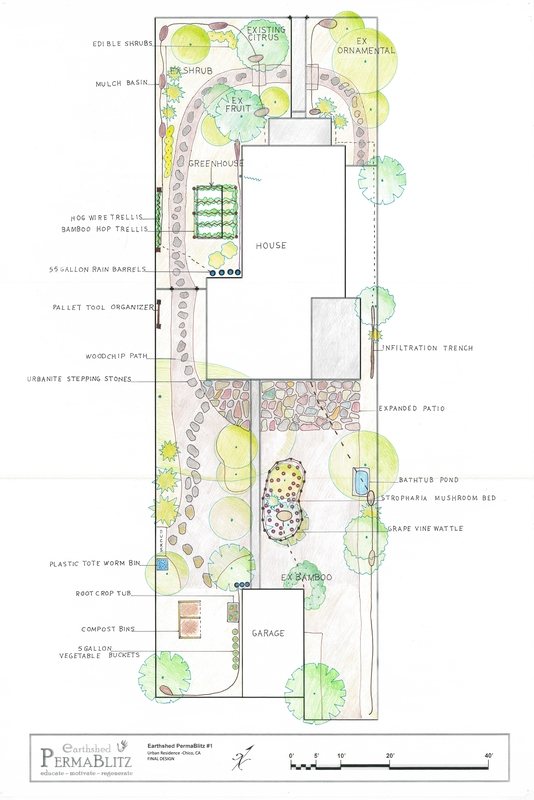 Every PermaBlitz has a permaculture design done by someone who has a Permaculture Design Certificate (PDC) because we want to create functioning permaculture systems that work for the people who live there as well as for local wildlife and the land itself. Days of rain and drizzle cleared up to a beautiful Sunday on April 9th for Earthshed Solutions’ first PermaBlitz! The weather cooperated and the urban backyard was ready to be ‘Blitzed! After the initial welcome circle, the final design map was revealed. The design elements were explained to the group, and then work began in earnest. With more than 25 participants, the small lot was bustling! A huge pile of delivered wood chips was spread by those willing to yield shovels, rakes, and wheelbarrows. PATHWAYS: Wood chips were spread on a predetermined path. Wood chips help maintain moisture in the soil, suppress “weeds,” foster healthy soil biota, define access, and when it rains, keep the paths from becoming muddy. planters for tomatoes, potatoes, sweet potatoes and peppers for additional food for the Host and tall enough for the ducks not to damage. In the summer, the yard is heavily shaded and the buckets can be moved to the few sunny spots in the yard. WORM BIN: A worm bin was made from an old plastic tote and will be used for composting kitchen scraps, feeding ducks, and worm casting production. bamboo to allow the Host’s Cascade hop plants to grow. The hops will shade the greenhouse in summer, but die back in the winter to let the sun’s warmth collect in the greenhouse and west side of the house. In addition the hops will be used for beer making, young hop shoots for eating, fresh hop leaves for cooking, and steeped hops for tea to aid in digestion. inoculated with the edible Stropharia mushroom spawn (also called Garden Giant mushroom) for harvesting later in the year when the mushrooms fruit. A wattle border was made out of grape vines grown on the property. The wattle was placed around the mushroom bed to deter the family ducks when the Stropharia fruit and to define the bed as separate from the main walkway. PLANTING: In the front and side yards, hops, blueberries, Greek oregano, mint, and assorted perennials were planted for additional edible food to add to the existing urban food forest. After the pathway project and a couple activities were completed in the morning, the Host provided participants with a tasty and hearty lunch of duck egg frittatas, polenta, chili, salad, and a variety of tasty snacks and hot, cold, and fermented drinks. Homemade apple pie rounded out the meal and then everyone was back to work. Between the main projects, additional activities included learning about the benefits of Sweet Bay leaves and threshing wheat and quinoa. 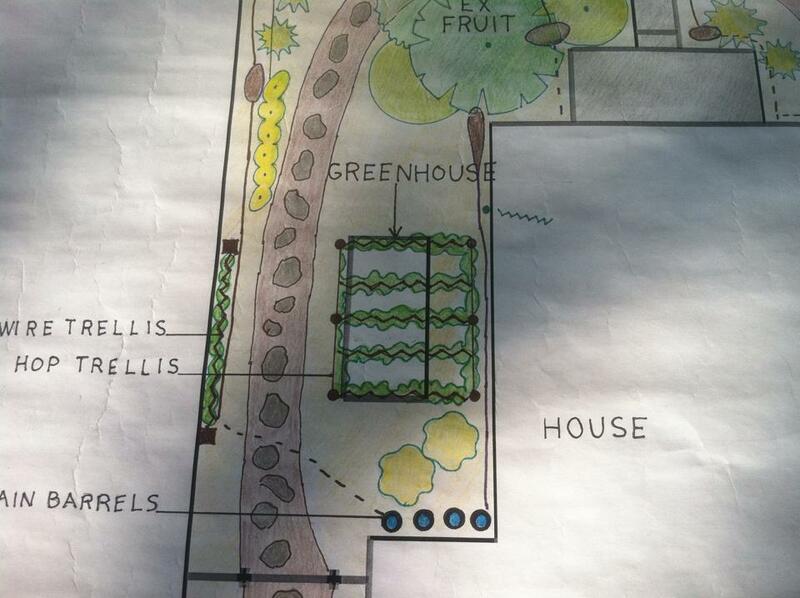 The group worked hard and accomplished several projects and activities to make the permaculture design come to life. As a bonus to participants for their hard work Sweet Bay clippings and Cascade hop plants were given away to use and plant at their own homes. The Host will continue working on other design elements and objectives that were included in the final permaculture design, such as: install gutters and rain barrels to collect rainwater from the roof, dig mulch basins and infiltration trenches to capture and soak winter rains, place urbanite stepping stones on the wood chip path for barefoot walking in the summer months, enlarge an existing patio with urbanite and other paving materials, create a composting system using two bins, convert an existing bathtub to an aquatic pond for growing out azolla or duckweed to feed the ducks, and convert another tub into a perennial root garden to outwit the gophers. The PermaBlitz was organized by Earthshed Solutions, a local nonprofit organization and facilitated by the Chico Permaculture Guild, an education program of Earthshed Solutions. PermaBlitz #2 is scheduled for October 15th at a homestead in Butte Creek Canyon. We will keep everyone updated on our Facebook page as well as our website. View Photos of PermaBlitz #1 here!